I haven’t been to a H&M store in years. I outgrew the whole phase of needing to be trendy so I’ll buy cheap items that last a handful of wears, but recently I’ve seen a lot of bloggers pick up some super cute pieces at dirt cheap prices, so of course I couldn’t resist checking out the 5th Ave store while waiting for a friend today. I wandered around and was not too surprised to see a lot of clothes that felt like super rough and poor quality, that I can just envision totally changing shape within a couple washes. 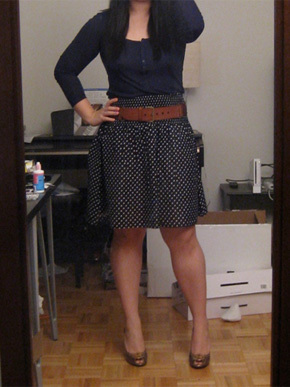 Then I spotted this super cute, simple polka dotted skirt with a smocked waist. It was thin but not see-through thin, and only $9.95! I didn’t even bother trying it on, I bought it and left. The henley is only $9.95 from H&M as well and probably similar quality to the “tissue” material henleys J.Crew pumps out. 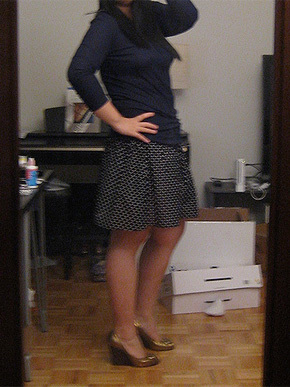 Cheap outfit but cute, right? 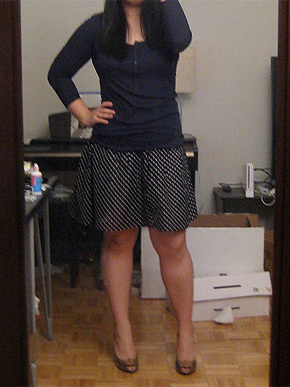 I love that the skirt is so flattering but so comfortable. 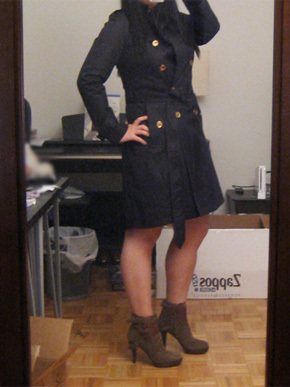 I’m guessing it won’t work with tights for Fall/Winter because the material will cling onto tights, but while the weather isn’t too cold yet, I can wear them with my new Nine West Destry boots! 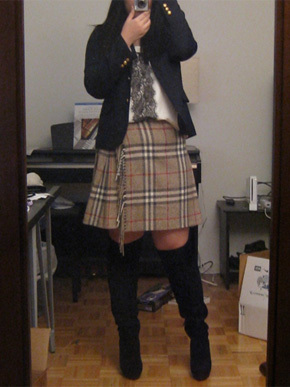 Throw on my J.Crew Schoolboy Blazer and I will be comfy but cute. Love, love, love! Anyone else discover great steals at H&M these days? Do share! The boot craze continues. I don’t remember where I first saw the Nine West Donley booties, but I definitely did a double take because of the super cute military edginess and the amount of detailing. I forgot about them briefly, but then saw them again featured on TV when someone was talking about the military trend. 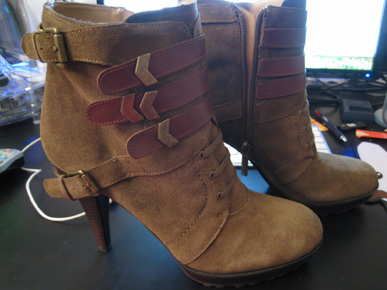 I went on a hunt to find where I had first seen these, and was surprised when I saw that they were Nine West. I didn’t think Nine West usually had shoes with this amount of detail. But I was super happy about their being Nine West because that means they’re not too expensive and would be comfortable. Who am I kidding – even if these were uncomfortable, I wouldn’t care! Of course, they were completely sold out in the only two places that carried them – NineWest.com and Macys.com. I thought maybe I was too late to the party and it was over. I probably googled “Nine West Donley” every day to see whether they would restock. Then bam, one day, a whole slew of sites started carrying them. Glad I caught this new batch – I’m sure they’ll sell out again soon! Ugh, too cute! Looks like it has a 4″ heel, with a 1/2″ platform. Would not ordinarily think of this as comfortable, since we’re talking about a 3.5″ pitch here. But surprisingly, they are! I did my normal ball-of-feet test with high heels, where I stand still for a while and see if they kill the ball of my feet. If they do, that probably means the pitch is too great to really walk comfortably for an entire day. Well, these passed! They don’t feel too high to walk in at all. Definitely not as comfy as the Destry boots or my Irina clogs, but definitely comfortable for such a hot shoe! Here’s what I love most about these: usually I try to avoid above-the-ankle booties because they tend to cut off the line of your legs and make you look stumpy. For me, with my big ol’ calves, my legs look like big sausages that come to an abrupt end point. I’m not sure what it is about these, but the first thing I noticed is that they don’t make my legs look that way at all (I don’t think?). They kind of even look like they extend the line of my legs a little. Anyway, I LOVE them! I’ve spent the last few hours just walking around in them at home because I don’t want to take them off! Go snag a pair before they sell out! Get 20% off the $128.95 price here at Endless.com. I love boots. But then again, what girl doesn’t? I’m tired of purchasing boots though because of the added element of boot circumference; I never know what’s going to fit me well. It’s all thanks to years of strength training my legs from running track in school; the calves bulked up and decided to never go down. I have a couple pairs of boots but nothing that comfortable or cute. I saw some rave reviews of the Nine West Destry boots and how their comfort factor is “insane,” so I decided to give it a shot. 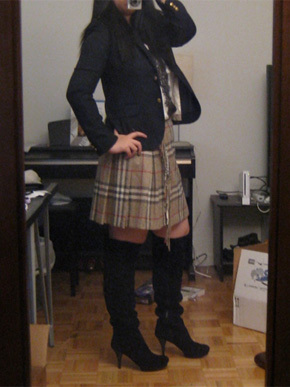 At first I didn’t even realize these were over the knee boots. But then when I realized, I questioned whether I could really pull it off; then I realized you can also wear these cuffed so that they’re not over the knee. These are just classic black boots that I think can look super cute (and match absolutely everything), but are also very comfortable because there’s a 1/2″ platform on a 3″ heel. Again, left picture shows cuffed, right picture is over the knee. 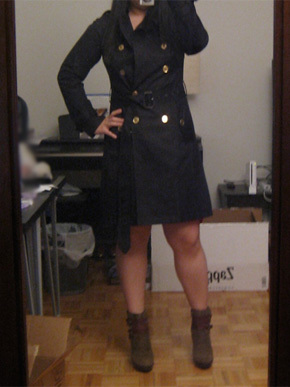 I love the fact that these don’t look at all like they’re low-heel boots, but they feel like frickin’ flats. I swear. The platform in the front does wonders. All in all, I’m totally in love with these boots. They fit me perfectly, they’ll keep me warm, and they look super hot but are incredibly comfortable. I’m surprised they’re not already sold out, but maybe they’re new. I’d grab a pair asap (unless you have skinny legs…in which case these may not be for you). Get the black leather version from Piperlime here for $199, the black suede version from Nine West here, or the dark brown suede from Macy’s here.